Reference number for this case: 20-oct-54-Raon. Thank you for including this reference number in any correspondence with me regarding this case. The "saucers" mystery explained at last? Saint-Remy (from of our envoys). -- At last, a precise, formal testimony, supported and with full details is to be filed in the huge file of the "flying saucers". A man saw the machine, he went by very close to it. Better, he was able to chatter - forgive the pleasant euphemism - with its occupant who, holding it at gunpoint with his revolver, asked him some questions. How far we are from the peaceful kiss given to the honest correzian peasant by his anonymous and mysterious visitor! And thus the legend of the Martians, Uranians and other Saturnians which stumble down from the sidereal void to visit our old planet named Earth with a worrying frequency is blow apart. Here, in the case which interests us, we do not find trace of the luminous or fluorescent trails which seem to borrow from the neon signs of the large stores, and which form part of the traditional saucerian arsenal. A saucer? For sure, since our witness claims this with an unshakeable conviction, there was one of them; But it was not luminous. And this is where the thing is original. But let us report the history as it was told to us by Mr. Louis Ujvari, 40 years old, originating from Slovaquia (this comes up handy since he spoke the language of the visitor) and who, after having badly wandered throughout the world and serviced ten years to the Foreign Legion, has settled at Saint-Rémy for three years. Mr. Ujvari (pronounce uivari) occupies with his wife and his five kids a small isolated farm, within the locality of "Le Bas", at the edge of the picturesque road which directs out of Saint-Rémy to the valley of Fraispertuis. The former legionary works with the Derey workshops, construction material in Etival, where he molds building blocks. Hard work. He must be on his building site at 3 in the morning. And that is the reason why he left his home to go to his workplace on Thursday, at 02:30 A.M..
After he rode on his bicycle for a few hundreds of meters, he had to put the foot down on the ground: the way is indeed in the process of repair and the roughcast stones of the roadway does not welcome bicycle riding. So he was pushing his machine with the hand, on the right side of the way, when he saw a silhouette, distinguished in the half-light. A short order, that he did not understand, but that he was able to comprehend, froze him on the spot. The former legionary Ujvari, who often closely faced death, did not tremble and waited. At this point in time the unknown advanced towards him, holding him under the threat of a revolver. Still directing his weapon at our man, our mysterious nightbird, whose intentions did not seem quite that peaceful, talked at him in a completely unknown language. Ujvari, as we said, roevered under all latitudes. He has the practice of a number of languages, having like all his compatriots a remarquable ease to assimilate foreign dialects. But he remaind mute. Because: he did not understand a damn word of all that his interlocutor asked him. "AM I IN SPAIN OR IN ITALY?" He had an outstanding idea: he ventured into announcing to that guy that he knew Russian. And that's when his "Martian" entertained him in this language which he knew perfectly. "To be sure, Ujvari tought, I'm dealing with a russian bloke." "Where am I?, asked the unknown. In Spain or Italy?" The former legionary undeceived him, specifying that he was in Saint-Rémy, in France, the Vosges, district of Saint-Dié. "How far to the German border?" asked the "Russian" then. Ujvari gave the requested precision: within 100 km off the Rhine in straight line. After that the unknown asked about the time. At this point in time the man, transffering his revolver to his left hand, and still holding his interlocutor at gunpoint, extracted a watch from inside the pocket of his wind-breaker. "You lie, he said angrily, it's four!" "How far and in which direction is Marseilles?" At least the workman believed to understand that this was about the ancient city of Phocea, since the unknown had roughly pronounced "Marsilla." He again provided the precise information. Ujvari obeyed. Followed by his bodyguard which still held him in respect, he advanced on the road. mysterious flying saucers, which are discussed so much in the newspapers! The machine, high of 1 m 60 approximately and a diameter of three meters, was landed on the roadway. Our man, still under the effect of surprise, passed quite near to the saucer which he passed very close to. He had the strong temptation to stop, to touch the machine, of dark gray color as much as he could judge. But he felt the gun of the revolver close to his shoulders. He continued. He had had time to fix the exact shape of the saucer in his memory: two enormous coupled plates and, fixed on the higher part, a cupola of which came out a sort of antenna ending in winglets in the shape of corkscrew. "I exceeded the cupola by the head", Mr. Ujvari specify to us. Pushing his bicycle with the hand, the former legionary, still escorted by the unknown, crossed about thirty meters. The occupant of the saucer, secured with the information which he had requested, hasted the moment of separation. Louis Ujvari jumped on his bicycle and fled. But he stopped at the level of the first house, after having been riding on approximately 200 meters. Was he going to alert the villagers? To warn the mayor? He did not have the time to do so. A headlight had just lightened up on the surface of the cupola, projecting its pencil of light vertically. A few seconds later, the witness of the frightening scene heard an engine noise, more exactly a whistle which developed. And he saw the saucer rising slowly vertically, a an helicopter would do. At ten meters above ground-level, the machine veered, accelerated its speed and disappeared, in the direction to Saint-Dié. The pilot had then extinguished the headlight and the saucer left absolutely no luminous trail. Ujvari saw the strange "spinning top" disappearing, after having followed it with the eyes during one half-minute. He returned on back on his steps, and at the gleam of his cigarette lighter, tried to find traces of the machine on the roadway at the place where it had been landed. But he discovered nothing to discover. The saucer left no mark printed on the ground. Of his mysterious Ivan, the former legionary could describe the following silhouette: a man of a size of 1 m 65, of strong stoutness, carrying trousers of fabric, a wind-breaker with a largely opened collar, lined skin, a bonnet of the balaclava kind out of cloth and shoes whose soles resounded on the stones of the roadway. Ujvari naturally informed his fellow workers of his incredible adventure on his arrival on the building site. He was called a joker by some, an illusioned by other. But he put so much conviction in tell by the details of the scene as he had just lived it that the skeptics were shaken. It is however only yesterday that the mayor of Saint-Rémy, Mr. Armand Cunin, heard of the case which spread on. The gendarmes of Raon-l'Etape were warned and investigated on the location. A moment later the police chief of the Renseignements Généraux [Intelligence] of Epinal, Mr. Moleur, accompanied by two inspectors, came in his turn to question Ujvari. The latter repeated the account of his nocturnal adventure, mimicking the gestures of the occupant of the saucer. Or then, witness and actor of a veracious and genuine - as much as incredible - adventure which would throw a new light on the origin of these mysterious machines which seem to furrow the sky? It must be said: the former legionary is not considered to be a visionary. He has both feet on ground and his statements were accommodated with a certain credit among the investigators. Other may think that he could have easily invented this story. The detail of the takeoff, of the schedules of the two watches does not fail to strike. That, in any case, comes to bring a probability to the account of Ujvari... Except if he went to use this to authenticate his account thanks to knowledge of the existence of time zones. In any event, official circles are highly interested in the case. If the former legionary said the truth, the fable of aircraft and other flying cigars in deep spaces would be put to an end. Saucers would ultimately only be machines based on our old planet and not leaving its sky. Their existence would seem to indicate that the propulsion by jet has a source of energy other than the fuel hitherto used, but rather of a nuclear energy. Going to his work, at 2:30 a.m.
From our special envoy Maurice Goffinet: If one takes the statements made to us by Mr. Lazlo Ujvari of Saint-Remy (the Vosges) seriously, there will soon be no mystery anymore as of their origin, at least, the secret of their functioning may be, too, lifted, some day or night, since it is known that these craft preferably land in the darkness, even if they suddenly appear before the hood of an amazed car driver or trouble the quiet pedaling of an innocent cyclist. So, Thursday evening, he was pedaling on the vicinal domain that links the Basses-Pierres to Saint-Remy. It was a morning like the other mornings. "The sky was cloudy," Mr. Ujvari told us, "there were quite frequently glows of the moon that allowed distinguishing the country to some extent. My dynamo was buzzing. But I soon had to put feet on the ground. At about 30 meters of my home the road is under repair and I was disturbed by pointed stones. I went around the wood that is on the edge of the road when a silhouette stood before me. The man was of average size and rather "chubby" (sic). Dressed of a jacket with a warm collar, long pants and shoes with hard soils certainly, because his steps sounded hard on the ground. On his head, he wore a helmet, of the motorcyclist helmet kind, but that must have been covered of a matte matter because it did not shine. What was brilliant however was a kind of stripe that the man had on each shoulder. He came to me frankly and "Halte" ["Stop"], an almost international word, was his first word. The rest was told in a language incomprehensible to me. Mr. Ujvari also specifies that the voice of the character was high-pitched "like a woman's voice." "I stopped short", Mr. Ujvari continues. I did not expect much to meet someone on my road at such an hour. The being advanced more to me and was at about 1m50. It is then that I saw that he had a pistol in his hand (and Mr. Ujvari, insists on this). I still did not understand anything to what he was saying, and I told him". Here a parenthesis is necessary: Mr. Ujvari was born in the Czech Republic forty years ago. He speaks our language almost perfectly and also most of the Eastern languages, in addition to German and Spanish. This is because he was in the Foreign Legion for ten years where he met men of all nations. "Decided to know what this armed character wanted from me, I told him in Russian: I speak Russian". - Me too, he answered to my great amazement, immediately adding in the same language: "Where are you going, man?" I explained to him that I was going to my workplace in Etival. He asked me what time it was. I took out my pocket watch: 2:30 a.m., I answered. The man took his pistol in the other hand to take out, also, a watch. - it is not true, it is four. I had to explain to him that it was really 2:30 in our country because I started to work at 3 a.m..
- Where are we here? In Spain or in Italy? Mr. Ujvari does not hide that this question first really puzzled him. He thought he was confronted to a stalled foreign car driver. The first idea - funny - that came to his mind, was that the man must have been seriously lost! - We are in France, he answered. - At 100 kilometers of the German border, at 100 kilometers from Strasbourg. - Is it far from Marseilles? - 900 kilometers, Mr. Ujvari, who was not in the famous "Marseilles jokes" mood. - Go away now, said the man showing the road to Mr. Ujvari. The latter did not need this to be repeated. But some curiosity made him ask still in Russian language to his strange interlocutor, where he was coming from. But the man did not seem to be ready to waste any time in useless confidences. Go, he did not cease to tell me, pushing Mr. Ujvari with the tip of his weapon. This is when having walked - bicycle at the hand - for about thirty meters, Mr. Ujvari suddenly had a shock at the heart. The narrow road was barred by a craft that Mr. Ujvari first thought to be an automobile. "But I did not see wheels, and the more I approached I distinguish what must be called a saucer on the background of the sky: a hull in the shape of a plate or rather two plates touching by their edges. The whole in a slightly tilted position. I did not distinguish feet. In the vertical axis above the craft, stood a rod with winglets". "The saucer had at first sight a diameter of 2m50 and a height of 1m60. The rod with the winglets, thick like a broom, was about 60 centimeters long". About the color, Mr. Ujvari is not much informed. It was in the night. The craft seemed metallic to him and dark grey. Anyway, no light came out of it. "I went at one meter, one meter fifty, of this "thing" Mr. Ujvari told us and the character did not want me to stick around. He went with me at 30 meters beyond the road. His last word was "sbogen". ("Goodbye" in Russian)." Having walked on for about 200 meters, Mr. Ujvari stopped and looking back he saw a vertical luminous beam like that of a powerful headlight pointed at the sky, rise from the place where he had seen the saucer. "I heard, he goes on, the craft "purr like a cat" that is to say louder than a scooter engine heard at such a distance. Then I saw it, thanks to its projector, rise vertically at a tremendous speed and the projector went off while it disappeared to the South". Mr. Ujvari does not hide that he pinched himself to make sure he had not been dreaming. Even at the risk of being late at work, he came back to the place of the saucer. Nothing was left of the passage of the strange craft. He then thought to alert someone at the village: "But, he said, I was afraid to be taken for a fool, for waking people up at such an hour." Needless to say that his story, a bit late, got some success among his workmates. From gendarmerie to squad section, from squad to central station, the message of the gendarmes of Raon-l'Etape made its way. "Another saucer story" scoff the phone standard employees. We have to say in all impartiality that in Saint-Remy one laughs a lot less now. Mr. Ujvari, father of family, is known there as sober, hard worker and not subjected to illusions, moreover not compatible with his military past. The gendarmes investigated very seriously on the saucer phenomenon. On the road, they unfortunately found no landing trace. During a long interrogation, Mr. Ujvari did not vary at all in his statements. "If only we had been two people", he repeats. "Do not waste my time once again with this saucer. I was with the gendarmes long enough this morning. I have to take care of my cow. If it dies, this is 120.000 francs lost... you understand?" This was how Mr. Ujvari greeted us when we were going to interview him, with Mr. Cunin, mayor of Saint-Remy. We managed to soften him nevertheless and this got us the strange story you just read. Our fellows from beyond the Vosges speak about the unusual encounter made in the area of Saint-Rémy (the Vosges) by a farmer of the place, named Ujvani [sic], Wednesday morning around 3 hours. While he was goint to his workplace by bicycle, Ujvani [sic] had to put foot at the ground on a portion of the way in the course of repair. At this time, a man left the darkness of a hedge. He held a revolver in the hand and talked to the cyclist in a language that the latter did not understand. Such is the statement that Ujvani made with the gendarmes of Raon-l'Etape. EPINAL, October 23 ("France-Soir" telegram). A worker from a materials company, Mr. Ujvari, 40-year-old, residing at Saint-Rémy, near St. Dié, former legionnaire, met the other night at the edge of a wood an individual dressed in an outfit and wearing a motorcycle helmet standing next to a machine 2 or 3 meters in diameter in the form of two plates glued together. The worker, who is of Czech origin, called out to the man and was surprised to hear him answer in Russian. But the "Martian" was not in the mood to continue the conversation. Revolver in hand, he "escorted" the worker to a distance. A few minutes later, Mr. Ujari heard a whistling sound and saw the craft that went back into the sky almost vertically. Do the flying saucers ultimately come from behind the iron curtain? 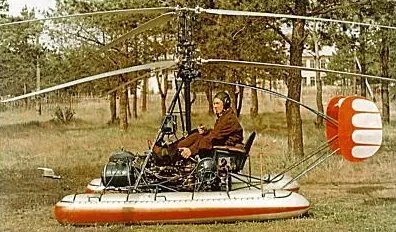 The thesis put ahead by many for a long time, that makes of these craft Soviet reconnaissance apparatuses, was reinforced yesterday by the testimony of a Czech man established in the Haute-Vosges. Louis Ujvari, aged 40, factory worker in St Rémy went to his work Wednesday towards 02:30 of the morning when he met an individual equipped of a revolver who talked to him in an unknown language. 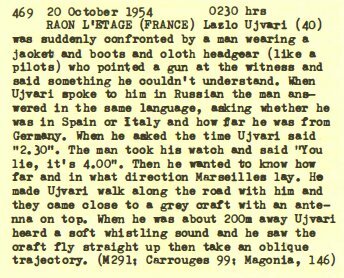 Ujvari speaks several languages; he proposed Russian and had the surprise to hear his interlocutor ask him several questions in this language: The unknown requested to hear where he was; had the exact place located, asked the exact hour, observed that this hour, 02:30, did not correspond with his, 04:00, and finally ordered to the workman to go away. The man was approximately 1,65 meters, he carried a pilot flight suit and shoed shoes. Whereas the workman advanced, preceding his interlocutor, still armed, of some steps. He saw a strange object posed on the road, resembling two plates turned over one on the other. A kind of periscope emerged from it, the machine was 1,60 meters high on 2,50 meters in diameter. The unknown then says goodbye in Russian and set out again towards his apparatus. The workman took his bicycle and went, and did not dare to look back before being at a hundred meters. At this time a vertical headlight pierced the night. The machine rose slowly. It took height, emitting a noise comparable with that of a sewing machine. It did not emit any gleam. Ujvari manage to follow the mysterious machine on approximately hundred meters, then lost it in the night. The workman then returned at the place where the machine was, but he did not discover any trace. Yesterday, after having hesitated a long time, ended up going to see the mayor of his town, whom he made the account of his adventure. An investigation was opened at once, in which two police chiefs of the General Intelligence took part, and lengthily questioned Mr. Ujvari. A flying saucer pilot who spoke Russian and asked how far it was from the German border was reported by a Czech workman from St. Remy near Epinal, France. The workman, Louis Ujvari, 40, told the police the saucerian, who held a revolver on him, was heavily-built, wore a crash helmet and shining epaulettes. He asked whether he was in Italy or Spain, then said goodby in Russian. The saucer looked like "two air plates (whatever it is -- Ed.) face to face," with a periscope sticking out. As it flew away it made a noise like a sewing machine. Science-fiction author Jimmy Guieu was one of the first in France to become interested in the flying saucers reports. In his 1956 book he reports that on October 20, 1954, at 02:30 in the morning in France in Raon-l'Etape, Lazlo Ujvari suddenly encountered a man carrying a jacket, boots and a helmet like those of pilots. The man pointed his rifle in his direction and said something that he could not understand, but when Ujvari spoke to him in Russian, the man was able to answer him and asked him whether he was in Spain or Italy, then at which distance he was from Germany. When he asked about the time and Ujvari told him it was 02:30, the man took his watch and replied: "You lie, it is 4 A.M." He then asked the distance and direction to Marseilles. He had Ujvari walking on the road under the menace of his gun and they approached a gray machine, 2.5 meters in diameter and a 1.50 meters in height with an antenna at its top. When he was approximately at 30 meters of the machine, the unknown man ordered Ujvari to move away. Ujvari obeyed but turned around from time to time and saw the object rising straight, with the noise of a sewing machine, then taking an oblique trajectory. The author indicates that in the middle of the night at 2:30 a.m. Mr. Ujvari, aged 40, of Slovak origin, former légionary, workman at the factories of breeze blocks Etablissements Deray, went for his workplace in Raon L'Etape, in the Vosges. He must climb down his bicycle in the course of road and walk while pushing it because of road works, when suddenly he is challenged by an unknown who arrives opposite him and utters at him what resembles an incomprehensible and imperative command. The tone is such that the witness stops even without understanding, which was careful, as the unknown aimed a revolver. The man speaks again, but Ujvari does not understand and at any chance speaks Russian and this time the unknown answers in the same language and requests "Where am I in Spain or Italy?" Ujvari answers and the unknown still asks "How much to the German border?" Then it asks for the hour, Ujvari answers "2:30", on what the unknown draws a watch from his windbreaker without dropping his revolver, looks at the hour and protests "you lie, it is four o'clock". Then he still questions: "how much to, and in which direction, is Marseilles?" After that, he commands Ujvari to walk along the road. Ujvari had already seen ahead a kind of machine which he had mistaken for a car but now that they passed very close at its side, he sees that it is like two reversed plates glued one on the other, of dark gray color, topped by a kind of antenna in the shape of a corlscrew. The man escorts him still on 30 meters and shouts at him "Now, good-bye!" Ujvari leaves, goes up on his bicycle and when he is approximately 200 meters further, almost at the entry of the village, he hears behind him a kind of whistling sound or a "noise of sewing machine", the noise of the mysterious machine which flies away vertically then in oblique. Michel Carrouges comments on that one could believe that the flying saucers are Russian, that if the details given are exact Mr. Ujvari is a remarkable observer, since he describes that the outfit of the unknown was a baclava out of cloth, a wind-breaker with an open collar with fur, trousers of fabric and boots which soles sounded on the stones of the roadway. Michel Carrouges notes that the conditions of visibility were not very good, that time was shorter for the observation of the saucer than it was for the pilot, as Ujvari did not stop walking by, under the threat of the revolver. Michel Carrouges notes that under these conditions he mightnot have seen the blades of a helicopter, that he did describe a noise heard at 200 meters and that the possibility that it was a Russian helicopter thus cannot be excluded. Oct. 20, 1954, 02:30 A.M., Raon-l'Etage (France). Forty-year-old Lazlo Ujvari was suddenly confronted by a man wearing a jacket, boots, and cloth headgear (like a pilot's) who pointed a gun at him and said something he could not understand. When Ujvari spoke to him in Russian, the man answered in the same language, asked whether he was in Spain or Italy, and how far he was from Germany. When he asked the time, Ujvari said: "2:30." The man took his watch and said "You lie; it's 4:00." Then he wanted to know how far and in what direction Marseilles was. He made Ujvari walk on the road with him, and they came close to a gray craft with an antenna on top. When he was about 200 m away, he heard a soft whistling sound and saw it fly straight up, then take an oblique trajectory. (Carrouges 99; Magonia). In the list of the "cases nonallowed to the classification" of the CE3's, the case "24-10-54 Raon - l'Etape, the Vosges, Fr", witness " Ujvari ", is listed, with the explanation "possibility of error by the witness". The author indicates that on October 20, 1950, Lazlo Ujvari, forty years old Czech workman living in France, went to his work which started at 3 o'clock in the morning, close to Raon l'Etape, in the Vosges, when at 600 meters of his house, he met a squat man of average size, capped with a motorcylcist helmet, and carrying a rifle. This foreigner spoke in an unknown language. The witness knowing a bit of Russian tried to speak to him in Russian, and the man who spoke with a high-pitched voice understood at once and asked him: "Where am I? In Italy? In Spain?" then wanted to know at what distance he was from German border and what time it was. The witness told him that it was approximately 02:30, the man produced a watch that showed 4 o'clock. Then the man told the witness to follow him. Ujvari was soon in sight "of a gear which apparently, had landed on the road." It had the shape of two saucers stuck together, approximately 1.50 m in diameter and 1 m in height. The witness came close to it but when it was within 10 meters, the unknown man told him from to go away, and he saw the object soon rising vertically "while making the noise of a sewing machine." Lazlo Ujvari, forty-year-old, was suddenly confronted by a man wearing a jacket, boots, and cloth headgear (like a pilot's) who pointed a gun at him and said something he could not understand. When Ujvari spoke to him in Russian, the man answered in the same language, asked whether he was in Spain or Italy, and how far he was from Germany. When he asked the time, Ujvari said: "2:30." The man took his watch and said "You lie; it's 4:00." Then he wanted to know how far and in what direction Marseilles was. He made Ujvari walk on the road with him, and they came close to a gray craft with an antenna on top. When he was about 200 m away, he heard a soft whistling sound and saw it fly straight up, then take an oblique trajectory. (Carrouges 99). The author presents an interview by Michel Anfrol of national radio France Inter with the ufologist Jacques Vallée. About the case, Vallée says that from his point of view of data processing specialist interested by semantics, the dialogues between the witnesses and the "so-called UFO occupants" are absurd "in a characteristic manner" and that for example in 1954 a witness who crossed a wood at 4 o'clock in the morning close to a small town of Alsace encountered a man wearing an outfit, and he "mistook him for a pilot". There was a "difficult dialogue" because the witness "of Polish extraction did not understand anything of the language of the so-called pilot" but they finally understood each other when the witness spoke in Russian. Jacques Vallée says that the pilot asked "What time is it?" and the Pole answered "Four hours and a half", the pilot answered to this that "It is not possible! It is two o'clock", then asked "Am I in Germany or Italy?" and the witness answered "You are in France!" Jacques Vallée indicates that the unknown then entered into the forest after commanding the witness not to follow him, but the intrigued Pole did not obey and followed, and when arriving close to a clearing, he saw "an oval object posed on the ground". The man got inside, and the object took off at high speed, and "at this point in time, the witness realized that the supposed the pilot was not a pilot, and that he had spoken to someone else" and that "later it will be told to him that it was probably the occupant of a UFO". Michel Anfrol asks Vallée what one can deduce from this testimony, and Valley states that it is improbable that it is a hoax, for when someone performs a hoax he does not invent absurd things, and that "moreover the witness didn't know anything of the UFO phenomenon". He then declares that "the descriptions and the details" that the witness provided "are consistent with what we now know of the phenomenon", that the dialogue is limited to "two absurd questions", "the first was a nonsense relating to time, the second relating to space", and that these are "constants" that are part of "all these discussions". He conclude by saying that "all the languages of the great mythical texts of humanity remain based on nonsenses of this kind". In example of his thesis according to which UFOS disguize in familiar things to delude the witnesses, the author indicates that in front of a Czech political refugee, they take the appearance of a Russian pilot. 37. 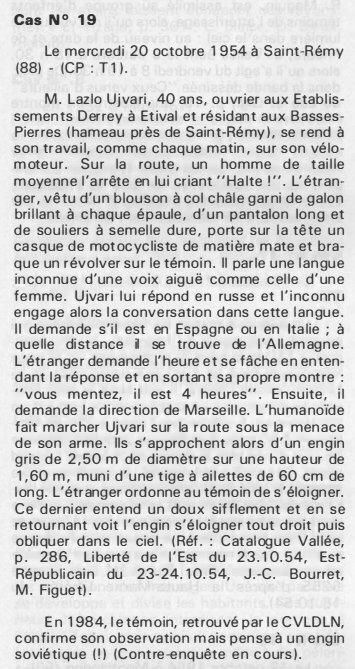 Encounter at Raon l'Etape (Vosges), October 20, by Laszlo Ujvari: unattributed French newspaper clipping of about October 24, by Pierre Masson; Jacques Valee, Passport to Magonia: Regnery, Chicago (1969), pp 146-147. Pilot: - What time is it? Pilot: - It's impossible! It is 2 o'clock. Pilot: - Am I in Germany or in Italy? Witness: - You are in France! Mauclair indicates that the unknown being then went into the forest while ordering to the witness not to follow him, but the intrigued witness did not obey, and when arriving close to a clearing, he saw an oval object posed on the ground, in which the man entered and which took off at high speed. Mauclair indicates that according to Jacques Vallée, this case would demonstrate that the occupants of UFOs are not the extraterrestrial beings but time travelers, and that according to David Saunders, they are interdimensional travelers, while Mauclair indicates that they are "psychic metérializations" that are "half physical, half-ESP." Hendry says that UFOs are not extraterrestrial because the alien visitors behave in outright absurd ways, as for example in France in 1954 when a UFO naut aksed a witness where he was, and when told France, insisted that it was not, and the witness was given a similar hassle over the correct time as well. For this case, the two authors indicate that the witness, a former legionary, works in a construction material company in Etival, where he runs breeze blocks. He must be at his workplace at 3 in the morning; and for this reason he leaves his home at 02:30 a.m..
After having advanced a few hundred meters on his bicycle, he must put foot at ground, the road being in repair. He thus pushes his bicycle with the hand, staying on the side of the way, when he sees, contoured in the half-light, a silhouette. At this time he is at the location called "the Las." A short order that he does not understand freezes him on the spot. At this point in time an unknown advances towards him, holding him under the threat of a kind of revolver, and he talks to him in an absolutely unknown language. The witness, Czechoslovakian of origin, does practice an number of languages, but he remains silent. He does not understand a word asked to him by this mysterious armed character. He ventured to tell him that he speaks Russian, and then the beings talks to him in this language that he seems to know perfectly too. The conversation begins, it will be short. "Where am I?" requests the unknown. "In Spain or Italy?" The former legionary corrects him, specifying that he is in Saint-Rémy in France, the Vosges, district of Saint-Dié. "How much to the German border?" the beings asks. The witness gives the requested information: "at 200 km in straight line". After that, the unknown asks for the time, "02:30", is the answer. At this point in time the man, passing his "weapon" to his left hand and always holding his interlocutor under menace, searches in his wind-breaker and pulls out a watch; "You lie," he says harshly. "It is 4 a.m.. How far and in which direction is Marseilles?" (pronounced "Marsilla"). The witness still provides the information with precision. The conversation then was over. The being makes the witness walk ahead of him, and tells him: "Go now." The witness passes just besides (he could have touched it) a gray vessel with an antenna in the shape of a corkscrew on the top; which is on the road. When it is at approximately 200 meters, he hears a soft whistle, and sees the one meter sixty high object of an approximately diameter of three meters take off vertically, after having projected a ray of light vertically. When at ten meters above the ground, the apparatus veers, accelerates its speed and disappears in the direction to Saint-Dié. This disappearance is observed during 30 seconds. The witness made a detailed description of the being. Height: 1 m 65, of strong stoutness, carrying trousers of fabric, a wind-breaker with a largely opened collar, coated with skin inside, a bonnet made of cloth of the balaclava kind and shoes whose soles resounded on the stones of the roadway. The witness turned and went back on his steps, and with the gleam of his cigarette lighter he tried to find the traces at the place where the machine had been posed. But he could not discover anything. The gendarmes of Raon-L'Etape were alerted and came to investigate on the premises, as well as the police chief of the general intelligence of Epinal, accompanied by two inspectors. The authors indicate that the sources are case 291 of the Vallée catalogue; Jimmy Guieu in Black-Out sur les S.V., page 226; JEan-Claude bourret in La Nouvelle Vague des S.V. page 150; La Liberté de l'Est for October 23, 1954; Le Matin for October 22, 1954; L'Echo for October 25, 1954; La Croix for October 24-25, 1954; and Michel Carrouges in Les Apparitions de Martiens page 99. Going to investigate does not always involve a meeting with the witness. We have reduced the Ujvari case by an extended stay in the Vosges and a long work on the phone with Poland, while the witness lives in the Pyrénées. To us, only the result matters. One of the criticisms addressed to these ufologists was that they investigated by phone calls. The authors indicate that in Saint Rémy in the Vosges on October 20, 1954, "although there are strong chances so that it was a mistake perhaps embellsihed into a UFO adventure," a former legionary which exerted a hard work in a construction firm was going at work at 3 in the morning by bicycle. The road being in repair, he had put foot at ground and then saw in front of him, a silhouette, and he heard an order which he did not understand "but which froze him on the spot." It then saw a unknown advancing towards him, holding him under the menace of a revolver. The witness, of Czechoslovakian origin, Mr. Lazlo, speaking several languages, ventured in saying that he spoke Russian and "at once a short dialogue began in this language", the unknown asking him where he was, believing to be in Spain or Italy. Learning that he was in France, he asked for the distance to the German border. He then asked for the time and the witness answered it was 2:30, but the man answered harshly, "You lie, it is 4 o'clock." The conversation when on a few moments, then, the unknown made the witness walk in front of him and finally told him "go, now!" A little further, the witness saw on the road "a gray ship with an antenna in the shape of a corkscrew" then saw the machine taking off initially vertically with a soft whistling before moving away in the direction to Saint-Dié. The authors note that the description of the unknown makes more think of a soldier than of an extraterrestrial beings: trousers of fabric, wind-breaker with opened fur collar, balaclava bonnet out of cloth and seemingly shoed for the soles resounded on the stones of the road. They indicate that these disconcerting details prompted investigations by the gendarmerie and the intelligence service, but the case was never cleared up. They indicate that the sources are J. Guieu in "Black Out sur les S.V." page 226, J.C. Bourret in "La nouvelle vague des S.V." page 150 and many newspapers of that time, such as Le Matin for October 22. "We tell the story as told by Mr. Louis UJVARI, 40-years-old, from SLOVAKIA (it is really good since he spoke the language of the visitor). He lives with his wife and three kids in a small, isolated farmhouse at "LE LAS" on the edge of the road leading from SAINT REMY to the valley of FRAISPERTUIS. The former legionnaire is employed at the DEREY establishments, building materials at ETIVAL, where he molds construction blocks. At 2:30 a.m. he left his home to go to his work place, and after riding his bicycle a few hundred meters, he had to dismount: the road was being repaired and was paved with a carpet of pebbles. He was pushing his machine on the side of the road when he saw a silhouette in the half-light, a brief order which he did not understand but which he could translate nailed him on the spot. The legionnaire former did not shiver and waited. It was then that the stranger advanced towards him holding him under the threat of a revolver. The mysterious nocturnal man, whose intentions did not appear otherwise peaceful, talked to him in an absolutely unknown language. UJVARI, who had roamed all around the world, knows a lot of languages, but he remained silent. For a moment he did not understand a word of all that his interlocutor asked him. He spoke Russian and the Martian collocated him in that language. The conversation was brief. "Where am I? in Spain, Italy?" The former legionnaire corrected him, telling him that he was at SAINT REMY in France, Vosges, district of SAINT DIE. "How far from the German border?" UJVARI gave the required precision: 100 kilometers from the Rhine in straight line, after what the stranger inquired about the time. "2:30 am" was answered. It was then that the man passed his revolver to his left hand and still holding his interlocutor in sight rummaged in his locked pocket of his jacket and pulled out a watch. "You're lying," he said roughly, "it's 4:00 a.m.!" How much and in what direction is MARSEILLE (pronounced MARSILLA). He also provided the information accurately. There stopped the interview. "Go now!" Ujvari complied, followed by his bodyguard, who was still holding him at gunpoint, he walked towards the road, he saw a saucer one meter sixty high, 3 meters in diameter placed on the road. UJVARI passed close to the saucer he almost touched. He intended to stop and touch the gray-colored craft, but he felt the cannon of the revolver close to his shoulders. The shape of the saucer: two enormous attached plates fixed on the upper part, a cupola from which came out a kind of antenna ending in fins in the shape of a corkscrew. "I was higher of one head than its dome, Mr. UJVARI was able to tell us. Pushing his bike in his hand, the former legionnaire still escorted by the unknown walked for about thirty meters. "And now goodbye!" Louis UJVARI got on his bike and took off. But he stopped at the height of the first house after riding 200 meters, a headlight had just lighted on the surface of the dome projecting its light beam vertically. A few seconds later, the witness heard an engine sound, rather a hissing sound. He saw the saucer slowly rise vertically. About ten meters from the ground the craft turned, accelerated its speed and disappeared heading to SAINT DIE. The pilot had then extinguished his headlight and the saucer did not leave any luminous trails. UJVARI saw the strange top disappear after watching it for half a minute." Comments: It seems that someone in the UFO world would have found the witness who would have confirmed a hoax. We would be happy to have this evidence, since our investigation in 1982 did not reach the witness. Note however that this case is the only known "humanoid" case in the Vosges. On Wednesday, October 20, 1954 in Saint-Rémy (88) - (ZC: T1). Mr. Lazlo Ujvari, 40, a worker at Etablissements Derrey in Etival and living in Basses-Pierres (hamlet near Saint-Rémy), goes to work, like every morning, on his moped. On the road, a man of average size stops him shouting "Stop!". The stranger wearing a shiny shawl collar at each shoulder, long pants and hard-soled shoes wears a matte motorcycle helmet on his head and shoots a gun at the witness. . He speaks an unknown language in a high voice like that of a woman. Ujvari answers him in Russian and the stranger then starts the conversation in that language. He asks if he is in Spain or Italy; how far is it from Germany. The stranger asks for the time and gets angry when he hears the answer and takes out his own watch: "you lie, it is 4 o'clock". Then he asks the direction of Marseille. The humanoid makes Ujvari walk on the road under the threat of his weapon. They then approach a gray vehicle of 2.50 m in diameter and a height of 1.60 m, equipped with a finned rod 60 cm long. The stranger orders the witness to go away. The latter hears a soft whistling sound and, turning around, sees the craft moving straight ahead and then oblique in the sky. (Ref . : Vallée Catalog, page 286, La Liberté de l'Est for 10/23/54, l'Est Républicain for 10/23-24/54, J.-C. Bourret, M. Figuet). In 1984, the witness, found by the CVLDLN, confirms his observation but thinks of a Soviet apparatus (!) (Counter-investigation in progress). Jacques Vallée indicates that conversations with UFO entities are simply absurd, because when a witness meets a UFO occuppant who asks "What time is it?" and replies "It's 2:30", only to be bluntly tols "You lie, it is 4 o'clock", the story is not just absurd but has "a symbolic meaning beyond the apparent contradiction of the dialogue", which is that the true meaning could be "time is not what you think it is" or that "time measurement is relative". Next, the UFO pilot asked if he was in Italy or Germany, so that no scientist could take this seriously and no public official would risk his career about it, and even a priest might avoid it for fear of demons. Jacques Vallée says the above happened in France in 1954. He concludes that "the UFO phenomenon" absurdities are made on purpose by the "phenomenon" itself so that it remains undetectable by the intelligentisia, the military and the church. The Belgian ufologist indicates in her chronology that in 1954, on October 20, in France "in Raon-l'Etape, at 02:30 Lazlo Ujvari was suddenly confronted with a man wearing a jacket, boots and a helmet like a pilot, who pointed a rifle in his direction and says something that he could not understand. When Ujvari spoke to him in Russian, the man answered in the same language, asked whether he were in Spain or in Italy and at which distance he was of Germany. When he asked for the hour and that Ujvari answered to him: "2:30" the man took his watch and said: "You lie, it is 4 hours". Then he wanted to know at which distance he was from Marseilles and what direction it was. He made Ujvari walk on the road ahead of him and he approached a gray ship with an antenna on the top (2,5 m diameter, height 1,50m). When he was approximately at 30 m, he unknown ordered to him to move away. He obeys but looked back from time to time and saw the object rising straight, with a noise of a sewing machine, then take an oblique trajectory." She adds that another version says: "The unknown aims a revolver. The pilot, he says, wore a cloth balaclava, a wind-breaker with open collar and fur, trousers of fabric and boots whose soles sounded on the stones of the roadway." The source for this other version is given as Michel Carrouges in "Les apparitions de Martiens" Fayard pub., 1963, p. 99, 100. A "MARTIAN" SPEAKING VERY GOOD RUSSIAN !!! EPINAL - A worker from Saint-Remy (Vosges) Mr Louis Ujvari, 40, told the gendarmes of Raon-L'Etape that last Wednesday around 3 a.m., while on his way to work, he had been called on the road by a bulky, medium-sized stranger dressed in a gray jacket with shiny insignias on his shoulders. The man spoke an unknown language. Mr Ujvari, a Czech national, tried to speak Russian at random. His interlocutor understood it perfectly. "Where am I?" He asked, "in Italy, or in Spain?" He then inquired about the distance to the German border and then asked the time. The worker told him it was still 2:30 a.m., the man took out of his jacket a watch that marked 4 o'clock in the morning. He gave the worker the order to move on. Soon Ujvari saw in the middle of the road a craft in the form of two plates upside down against each other, from which emerged a sort of periscope. Arrived at about thirty meters from the craft which was about 1 m. 50 high and 2 m. 50 wide, the stranger tells him to move away. But, bravely, looking back from time to time, Mr. Ujvari was able to see the craft slowly rise vertically with a "sewing machine noise". Reaching an altitude of 5OO meters, it took an horizontal trajectory and disappeared in the southern direction. In addition, testimonies collected over a month ago about the "flying saucers" and flying "cigars" seen in the sky of the peninsula, were the subject of a statement from the Italian Ministry of Defense Forces of the air. "Until now, the statement said, radar devices did not detect any craft of this kind, with the exception of airplanes and balloons whose characteristics are known." "Special instructions were given to the heads of the detection stations to intensify surveillance during the twilight hours and at night, during which, according to witnesses, were "flying disks" are seen, the statement added. "When it comes to the documentation of the "flying disks" owned by the Italian Air Force, it is only a matter, according to the communiqué, of some testimonies from officers who have seen these machines over the thyrrenic coast, moving in a south-north direction at a speed greater than 2,000 kilometers-hour." In the dead of the night a Czech living in France, M. Lazlo Cyvari [sic], claimed he had encountered a rature human-like saucer pilot near his home in Raon L'Etage. The stranger, Cyvari said, wore a helmet like that worn by motorcyclist and a gray jacket decorated with insignia. The heavy-set pilot showed a gun and conversed in Russian, wanting to know which country he had landed in. The UFO pilot then left in a machine -that looked like two big saucers placed rim to rim. 167. Evidently the Czech fellow wanted people to think Stalin's boys were tres passing on NATO territory, however that clashed with the opinion of the noted Italian airman Signor Manor Lualdi who was quoted by the press as saying: "If I had to bet on the origin of the saucers, I would say they are British." 168. On Wednesday, October 20, 1954, Mr. Lazlo Ujvari (40), a worker at the Derrey establishments in Etival and living in Basses-Pierres (hamlet near Saint Rémy (8) 8), went to work on a moped as he did every morning. On the road, a man of average size stops him by saying "Stop!". The stranger, wearing a jacket with a shawl collar trimmed with shiny braid at each shoulder, long pants and hard-soled shoes, wears a hard-shell motorcycle helmet on his head and points a revolver at the witness. He speaks an unknown language in a high-piched voice like that of a woman. Ujvari answers him in Russian and the stranger then engages in a conversation in that language. He asks if he is in Spain or Italy; how far is Germany. The stranger asks for the time and goes off on hearing the answer and taking out his own watch: "you lie, it is 4 o'clock". Then he asks the direction of Marseilles. The humanoid makes Ujvari walk on the road under the threat of his weapon. They then approach a gray vehicle of 2.50 m in diameter to a height of 1.60 m, equipped with a finned rod 60 cm long. The stranger orders the witness to go away. The latter hears a soft whistling sound and, looking back, sees the craft moving straight up and then oblique in the sky. Explanation: a counter-investigation was undertaken by the CVLDLN in 1979, it turns out again that it is a mistake with a helicopter and its pilot. Sources: catalog J. Vallée box # 291 page 310 in "Chronicles of apparitions ..."; Liberté de l'Est for 23/10/1954, Est Républicain for October 23 and 24/1954; Lusemburggerwort for 10/23/1954 in "Les Chroniques de la CLEU" # 24 page 24, newspaper L'Alsace for 10/24-25/1954; M. Carrouges "Les apparitions de martiens" pages 95.99 to 101 (where the Russian helicopter hypothesis is put forth), JC. Bourret; M. Figuet page 190. The authors say that on October 20, 1954, in Raon-L'Etape, the Vosges, France, at 2:30 A.M., a Czechoslovakian citizen living in France, Lazlo Ujvari, was heading for work starting at 3 A.M. when he met a portly man of medium height a quarter mile from his house. The man wore a gray jacket with shoulder insignias, a motorcycle helmet and was carrying a gun. After the man addressed Ujvari in an unknown language Ujvari tried speaking Russian, to which the stranger immediately responded, asking in a high-pitched voice, "Where am I? In Italy, in Spain,?" He then asked how far he was from the German border, and, "What time is it?" Ujvari replied, "It's 2:30." The being then pulled out a watch and bluntly snapped, "You lie-it is four o'clock." He then inquired how far and in what direction Marseilles was. He had Ujvari walk on the road with him. They soon came upon a grayish saucer-shaped craft (three feet high and five feet in diameter with an antenna on top) on the road. Ujvari approached to within thirty feet when the man told him to move away. The object flew off "with the noise of a sewing machine." The authors indicate that their sources are Jacques Vallee, The Invisible College (New York: E. P. Dutton paperback edition, 1976), pp. 26-27; Jacques Vallee, Passport to Magonia (Chicago: Henry Regnery, 1969), pp. 146-47; Allan Hendry, The UFO Handbook, New York: Doubleday, 1979), p. 141. Lazlo Ujvari, going to work late at night, encountered a heavy set man of medium height wearing a gray jacket with insignias on the shoulders, and a motorcycle helmet, which threatened him with a revolver and spoke words he did not understand. Ujvari spoke Russian to him and got a reply in that language. The unknown man then asked whether he was in Spain or Italy; then, what time it was. "0230", said Ujvari. "You lie," replied the man, taking out his own watch and announcing "Four o'clock!" He then escorted Ujvari past an inverted dish shaped, lightless saucer bearing a 2-foot antenna, which took up almost the whole width of the road. After 30 yards, he said, he said "Adieu!" After a few paces, Ujvari looked back; with a whine like an electric motor, the saucer rose vertically. i am the grandson of mr Ujvari, and I can assure you that it really is the truth, because some years ago my father told me about it, and then i asked my grandfather if it was true. Then he became very strange and he told me that it was true. That was 5 years ago he was aged 85, he barely stood on his legs etc. But what he told me i knew it was true. they even showed me the field where he saw this famous saucer. 1954 - At 2:30 a.m. Lazlo Ujvari, age 40, saw a dark domed disc in Raon-l'Etape, France that made a whining noise. He was suddenly confronted by a man wearing a jacket, boots, and some type of cloth headgear, like a pilot's leather helmet. The man pointed a gun at him and said something he could not understand. When Ujvari spoke to him in Russian, the man answered in the same language. He asked whether he was in Spain or Italy, and how far he was from Germany. When he asked the time, Ujvari said "2:30." The man took out a watch and said "You lie, it's 4:00." Then he wanted to know how far away and in what direction was Marseilles. He forced Ujvari to walk with him on the road, and they soon came to a gray craft with an antenna on top. The man left him there and went aboard. When Ujvari had walked about 200 meters from the craft he heard a soft whistling sound and saw it fly straight up, then take an oblique trajectory. (Sources: Jacques Vallee, Passport to Magonia: A Century of Landings, p. 235; Michel Carrouges, Les Apparitions de Martiens, p. 99). 02:30 : Raon-l' Etape (France), Lazlo Ujvari (aged 40) is suddenly confronted with 1 man wearing a jacket, boots and a helmet like a pilot, pointing a rifle in his direction and saying something that he cannot understand. When Ujvari speaks to him Russian, the man answers in the same language, asks whether he were in Spain or in Italy and at which distance he is from Germany. 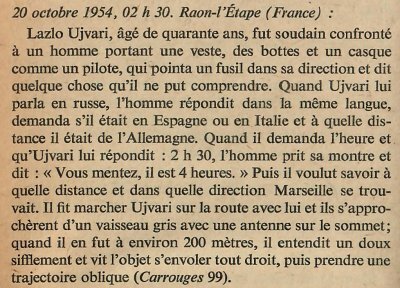 When he asks the hour and Ujvari answers him 02:30, the man takes his watch and says You lie, it is 4 h. Then he wants to know at which distance and in which direction Marseilles is. He makes Ujvari walk on the road with him and they approach a gray ship with an antenna on the top, when it is at approximately 200 m, he hear a soft whsiting sound and see the object flying away straight up, then take an oblique trajectory. Jérôme Beau indicates as source: "Carrouges, M. 99". Luc Chastan indicates in his database that in the Vosges in St Rémy on October 20, 1954 at 2:30 hours, "the witness (former légionnaire) works in a building material company in Etival, where he runs breeze blocks. He must be at his work at 3 in the morning; and for this reason he leaves home at 2.30. After having ridden a few hundreds of meters on his bicycle, he must put foot at ground, the road being in repair. He thus pushes its bicycle with the hand, standing on the side of the way, when he sees, detached in the half-light, a silhouette. He is at this time at the place called "Le Las". A short command that he does not understand, nails him on the spot. At this point in time an unknown advances towards him, holding him under the threat of a kind of revolver, and he talked to him in an absolutely unknown language. The witness, Czechoslovakian of origin, practise many languages, but remains silent. He does not understand a word that the mysterious armed character asks. He ventured to announce to the latter that he speaks Russian, at this point in time the being talks to him in that language that he seems to know perfectly too." "And the conversation begins, it will be short. 'Where am I, the unknown asks? In Spain or Italy? ' The former légionaire undeceives him, specifying to him that he is in Saint-Rémy in France, the Vosges, district of Saint-Dié. 'How far theGerman border ? ' the being asks. The witness gives the requested precision: 'at 200 km in straight line '. After that the unknown askth the hour, '2. 30 ', he is told. At this point in time the man, changing his 'weapon' to his left hand and always aiming at his interlocutor, searches in his wind-breaker and puts out a watch; 'You lie, he says rudely.It is 4 o'clock ', how far and in which direction is Marseilles ? '(pronounced 'Marsilla ')." He still provides the information with precision. There stops th talk. The being makes the witness walk in front of him, and tells him: 'Go now', The witness passes just to the side (he could have touched it) of a gray ship with an antenna in the shape of corkscrew on the top which is on the road, when he is within approximately 200 meters, he hears a gentle whistling sound, and sees the approximately one meter sixty high and three meters diameter object, take off vertically, after having projected a beam of light vertically; at ten meters of the ground, the craft veers, accelerates its speed and disappears in direction of Saint-Dié. This disappearance is observed during 30 seconds." "The witness made a detailed description of the being. Height: 1 m 65, of strong stoutness, carrying trousers of fabric, a wind-breaker with a largely opened furry collar, a bonnet of the balaclava kind out of cloth and shoes with soles that sounded on the stones of the roadway." "The witness returned on his steps, and in the gleam of his cigarette lighter he tried to find the traces at the place where the machine had been posed. But there was nothing to discover. The gendarmes of Raon-L'Etape were alerted and came investigate on the spot, as well as the police chief of the intelligence of Epinal accompanied by two detectives." The website indicates that on 20 October 1954 at 02:30 in Raon-l 'Etape, France, "Lazlo Ujvari, going to work late at night, encountered a man wearing a helmet, which threatened him with a revolver and spoke words he did not understand. Ujvari spoke Russian to him and got a reply in that language. The unknown man then asked whether he was in Spain or Italy; then, what time it was. '0230", said Ujvari. "You lie," replied the man, taking out his own watch and announcing "Four o'clock!" He then escorted Ujvari past an inverted dish shaped, lightless saucer bearing a 2-foot antenna, which took up almost the whole width of the road. After 30 yards, he said, he said 'Adieu!" After a few paces, Ujvari looked back; with a whine like an electric motor, the saucer rose vertically." The website indicates that on 20 October 1954 at 02:30, in Raon-l'Etage, France, "A gray craft with an antenna on top; a man wearing pilot's headgear with a gun". The website adds: "At 2:30 a.m. Lazlo Ujvari, age 40, saw a dark domed disc in Raon-l'Etape, France that made a whining noise. He was suddenly confronted by a man wearing a jacket, boots, and some type of cloth headgear, like a pilot's leather helmet. The man pointed a gun at him and said something he could not understand. When Ujvari spoke to him in Russian, the man answered in the same language. He asked whether he was in Spain or Italy, and how far he was from Germany. When he asked the time, Ujvari said '2:30.' The man took out a watch and said 'You lie, it's 4:00.' Then he wanted to know how far away and in what direction was Marseilles. He forced Ujvari to walk with him on the road, and they soon came to a gray craft with an antenna on top. The man left him there and went aboard. When Ujvari had walked about 200 meters from the craft he heard a soft whistling sound and saw it fly straight up, then take an oblique trajectory." The website adds: "Forty-year-old Lazlo Ujvari was suddenly confronted by a man wearing a jacket, boots, and cloth headgear (like a pilot's) who pointed a gun at him and said something he could not understand. When Ujvari spoke to him in Russian, the man answered in the same language, asked whether he was in Spain or Italy, and how far he was from Germany. When he asked the time, Ujvari said: "2:30." The man took his watch and said "You lie; it's 4:00." Then he wanted to know how far and in what direction Marseilles was. He made Ujvari walk on the road with him, and they came close to a gray craft with an antenna on top. When he was about 200 meters away, he heard a soft whistling sound and saw it fly straight up, then take an oblique trajectory." And: "An unidentifiable object and its occupants were observed at close range (Lazlo Ujvari)." *Oct. 20, 1954 - At 2:30 a.m. Lazlo Ujvari, age 40, saw a dark domed disc in Raon-l'Etape, Vosges, France that made a whining noise. He was suddenly confronted by a man wearing a jacket, boots, and some type of cloth headgear, like a pilot's leather helmet. The man pointed a gun at him and said something he could not understand. When Ujvari spoke to him in Russian, the man answered in the same language. He asked whether he was in Spain or Italy, and how far he was from Germany. When he asked the time, Ujvari said "2:30." The man took out a watch and said "You lie, it's 4:00." Then he wanted to know how far away and in what direction was Marseilles. He forced Ujvari to walk with him on the road, and they soon came to a gray craft with an antenna on top. The man left him there and went aboard. When Ujvari had walked about 200 meters from the craft he heard a soft whistling sound and saw it fly straight up, then take an oblique trajectory. (Sources: Jacques Vallee, Passport to Magonia: A Century of Landings, p. 235, case 291; Michel Carrouges, Les Apparitions de Martiens, p. 99). Lazlo Ujvari, going to work late at night, encountered a heavy set man of medium height wearing a gray jacket with insignias on the shoulders, and a motorcycle helmet, which threatened him with a revolver and spoke words he did not understand. Ujvari spoke Russian to him and got a reply in that language. The unknown man then asked whether he was in Spain or Italy; then, what time it was. ‘0230”, said Ujvari. “You lie,” replied the man, taking out his own watch and announcing “Four o’clock!” He then escorted Ujvari past an inverted dish shaped, lightless saucer bearing a 2-foot antenna, which took up almost the whole width of the road. After 30 yards, he said, he said ‘Adieu!” After a few paces, Ujvari looked back; with a whine like an electric motor, the saucer rose vertically. Lazlo Ujvari was suddenly confronted by a man wearing a jacket, boots and cloth headgear (like a pilot's), who pointed a gun at him and said something that he could not understand. When Ujvari spoke to him in Russian, the stranger replied in the same language and asked whether he was in Spain or Italy, and how far he was from Germany. When asked the time, Ujvari said 0230. The man took his watch and said "You lie, its 4.00 o clock". He then wanted to know how far and in what direction Marseilles was. He made Ujvari walk on the road with him, and they came close to a grey craft with an antenna on top. When he was about 200m away, Ujvari heard a soft whistling sound and he saw the craft fly straight up, then take an oblique trajectory. Not looked for yet. 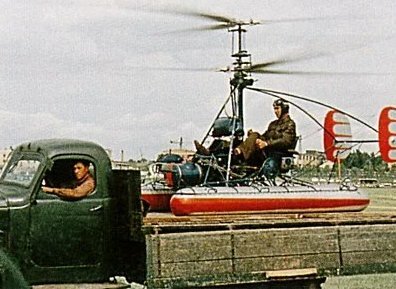 A lost Russian helicopter, Kamov Ka-10 type (Below) possibly? This is moreover the witness' opinion. [---] Article in the national newspaper Le Matin, Paris, France, October 22, 1954. [le1] Article in the regional newspaper La Liberté de l'Est, France, October 23, 1954. [---] Article in the foreign newspaper Lusemburggerwort, Luxemburg, October 23, 1954. [er1] Article in the regional newspaper L'Est Républicain, France, page 7, October 23-24, 1954. 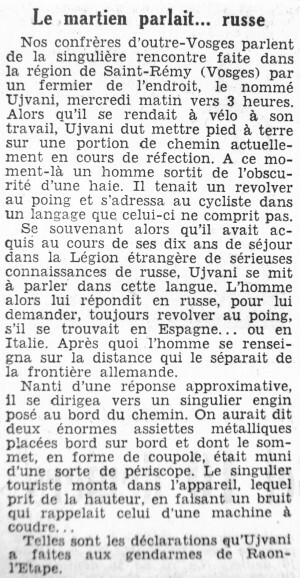 [la1] Article in the regional newspaper L'Alsace, France, October 24-25, 1954. [---] Article in the national newspaper La Croix, Paris, France, October 24-25, 1954. 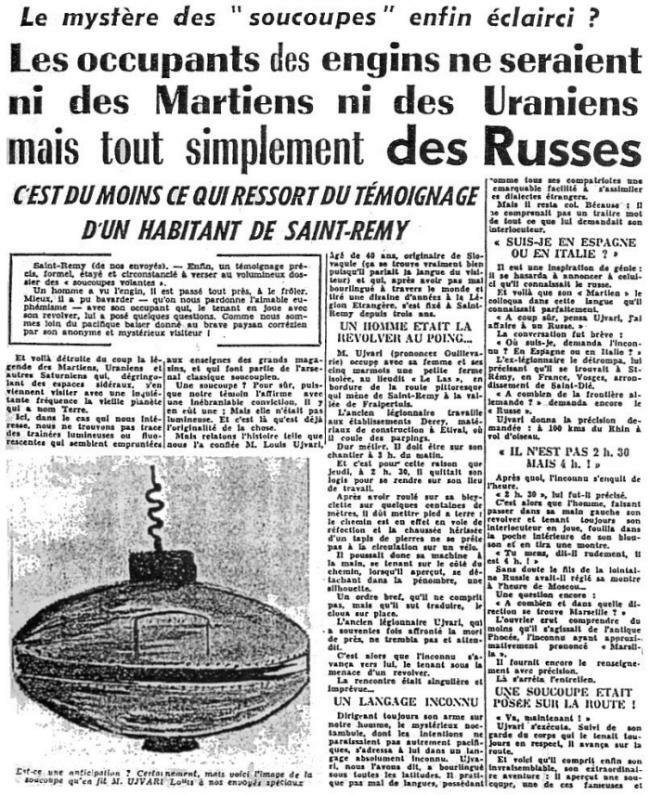 [---] "Un 'Martien' a parlé russe à un ouvrier des Vosges", article by Jacques Bergier in the national newspaper "Paris-Presse", October 24, 1954. 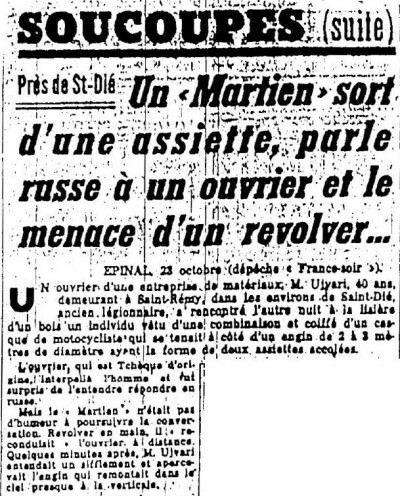 [---] Article in the regional newspaper L'Ardennais, France, page 1, October 25, 1954. [---] Article in the newspaper L'Echo, France, October 25, 1954. [qh1] Article in the regional newspaper Le Quotidien de la Haute-Loire, October 24, 1954. [jg1] "Black-Out sur les Soucoupes Volantes", book by Jimmy Guieu, Fleuve Noir, page 226, 1956. [mc1] "Les Apparitions de Martiens", book by Michel Carrouges, aka Louis Couturier, Fayard publisher, France, page 80, pp 99-101, 1963. [jv1] "Chronique des Apparitions Extra-Terrestres", French translation of "Passport to Magonia", book by Jacques Vallée, Denoel publisher, France, page 215, 1972. [jv1] "Passport to Magonia - On Ufos, Folklore, and Parallel Worlds", book by Jacques Vallée, Henry Regnery publisher, USA, pp 146-147, 1969. [jp1] "Les Extra-Terrestres", by Jader U. Pereira, GGIOANI Secretary, Porto Alegre, RGS, Brazil, in the ufology magazine Phénomènes Spatiaux, of the GEPA ufology group, France, page 25, September 1971. [jv2] "Chronique des Apparitions Extra-Terrestres", French translation of "Passport to Magonia", book by Jacques Vallée, Denoel publisher, France, page 215, 1972. [jb1] "La Nouvelle Vague des Soucoupes volantes", book by Jean-Claude Bourret, France-Empire publisher, France, 1975. [jb1] "La Nouvelle Vague des Soucoupes volantes", book by Jean-Claude Bourret, Presse Pocket publisher, France, pp 160-161, 1975. [bd1] "The UFO Register - The Official Organ of Data Research Contact International (U.K.)", compiled by J. Bernard Delaire, Volume 7, part 1 and 2, page 44, 1976. [jv3] "Le Collège Invisible", book by Jacques Vallée, Albin Michel, J'ai Lu, France, page 100, 1975. [jv3] "The Invisible College", book by Jacques Vallée, E. P. Dutton publisher, USA, pp 26-27, 1976. [pm1] "Le Mystère des OVNIS", book by Paul Mauclair, Vernoy publisher, pp 203-204, 1979. [fr1] "OVNI, Premier Dossier Complet des Rencontres Rapprochées en France", book by Michel Figuet and Jean Louis Ruchon, Alain Lefeuvre publisher, France, pp 190-191, 1979. [bb2] Letter by Gérard Barthel and Jacques Brucker to Michel Figuet, published in the ufology magazine Lumières Dans La Nuit (LDLN), France, #201, page 35, January 1981. [cn1] "Catalogue rétroactif 1954 des cas vosgiens (2 - suite)", compiled by the CNEGU, France, in the ufology magazine Lumières Dans La Nuit (LDLN), France, #263-264, pp 42-43, May / June 1986. [cn2] "Catalogue Régional des Observations d'Humanoïdes du Nord-Est de la France et du Luxembourg (1)", compiled by the CNEGU and the GPUN, in the ufology magazine Lumières Dans La Nuit (LDLN), France, #267-268, page 42, September / October 1986. [jv7] "Dimensions - A Casebook of Alien Contacts", book by Jacques Vallée, Souvenir Press publishers, U-K, pp 177-178, 1988. [cn3] "Catalogue Régional d'Observations d'Humanoïdes - 3ème édition", catalogue by the CNEGU, in their annual ufology magazine Les Mystères de l'Est, France, #1, page 6, 1995. [bh1] "UFOs And Alien Contacts - Two Centuries Of Mystery", book by Robert E. Bartholomew and George S. Howard, Prometheus Books publishers, USA, pp 300-301, 1998. [rl1] "Catalogue de Presse - Journal: "L'ARDENNAIS" - Département des Ardennes (08). ANNEE 1954", compiled by Renaud Leclet, in the annual ufology magazine Les Mystères de L'Est, CNEGU, France, #8, pp 67-68, 2003. [gs1] eMail to the author of this website on March 31, 2004. 1.0 Patrick Gross March 24, 2009 Conversion from HTML to XHTML Strict. First formal version. Additions [mc1], [cn1], [jb1], [ah1], [go1], [dj1], [lc1], [jb1], [ud1], [ud2]. 1.4 Patrick Gross August 19, 2010 Addition [cn2]. 1.6 Patrick Gross September 18, 2014 Additions [fs1], [ni1]. 1.7 Patrick Gross October 10, 2014 Addition [ta1]. 1.8 Patrick Gross October 17, 2016 Addition [la1]. 1.9 Patrick Gross November 22, 2016 Addition [er1]. 2.0 Patrick Gross December 9, 2016 Addition [gb1]. 2.1 Patrick Gross December 15, 2016 Additions [jp1], [db1], [lg1], [ub1]. 2.2 Patrick Gross January 26, 2017 Addition [ac1]. 1.4 Patrick Gross January 9, 2019 Additions [pr1], [bd1], [lh1], [pr2], [bb2], [cn3], [rl1].